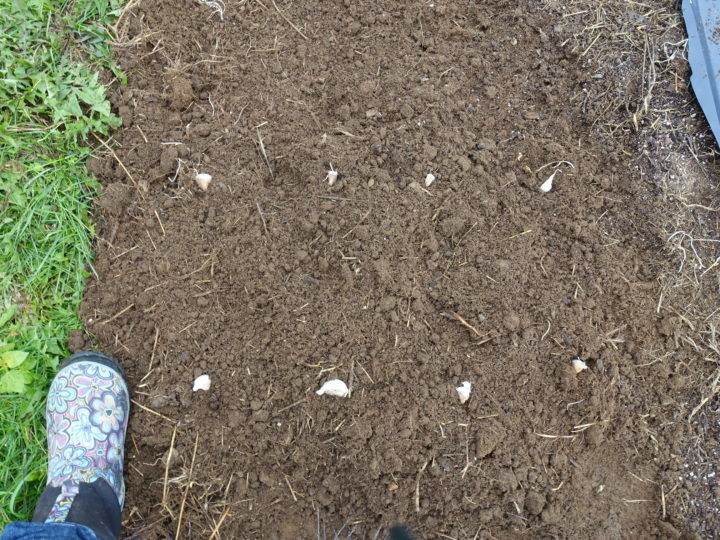 Reporter Abigail Curtis demonstrates some of the steps involved in planting garlic. Last year, it felt as if we did some crucial things wrong when it came to planting our garlic — and that’s why we wanted to try harder to do it right this year. Our major mistake was in timing. Garlic really ought to be planted in the fall, after the first light frost or two but before the ground freezes. But life got busy and we missed that (large) window last year and decided to plant our garlic in the spring. Garlic, though, needs a period of cold, called vernalization, in order for a clove to separate and form a head of garlic. Our spring-planted garlic skipped that step and so many of the garlic heads we harvested were comprised of just one large, round clove instead of the usual smaller, separated cloves. Jon Thurston, a Searsmont, Maine, garlic grower who plants 4,000 cloves each year, was kind when I confessed what we had done. A bigger mistake, he said, was one that we hadn’t made: getting our seed garlic from an unknown and untrustworthy source. That’s because a disease called white rot is making its way across the country. This destructive fungal disease can infect all plants in the allium family, but garlic and onions are most susceptible. White rot likes cool and moist soil conditions and eventually kills affected plants. Worse, once it’s in your garden or fields, nothing can be done about it other than to stop planting alliums there. 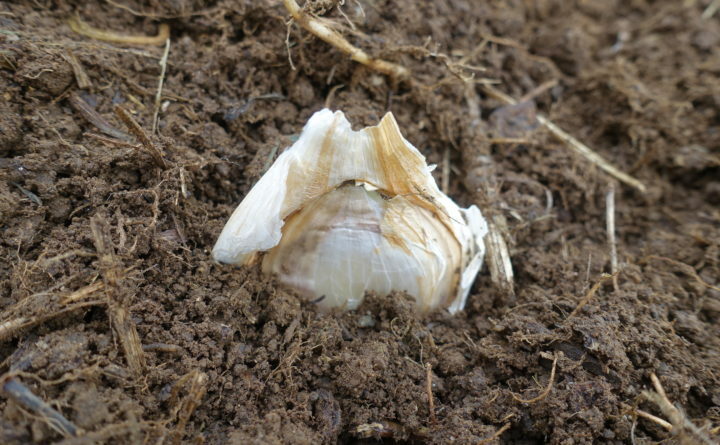 White rot can render a field unusable for garlic or onion production for as long as 40 years, and experts such as Thurston don’t take it lightly. He encourages folks looking for seed garlic to get it locally, from a trusted farmer. You can’t just go out and plant what you find at the grocery store, anyway, he said — some of that garlic is sterile and won’t sprout. Once you have your locally sourced, safe seed garlic ready to plant, you want to prepare your soil. Don’t plant your seed garlic where you did last year. In fact, the best thing to do is to make a four-year rotation schedule, so that you wait four years before planting garlic or onions in the same place again. When you have the location figured out, know that garlic loves rich soil. Thurston amends his soil with composted manure. 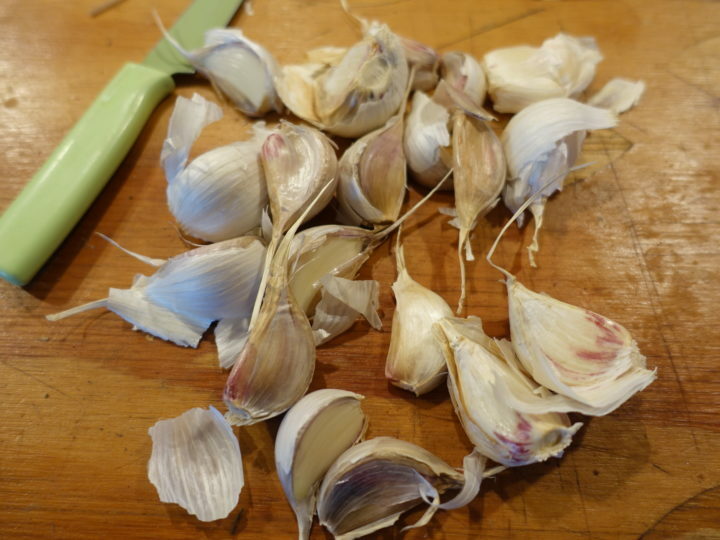 Garlic doesn’t grow well in soil that is too wet — it has a tendency to rot — and so Thurston uses a rake to raise the soil up about five inches in order to make temporary raised beds. “I like to get it up there just in case we have wet weather,” Thurston said. Because he has so many cloves to plant, he pushes a planter with spikes across his beds to make perfectly spaced holes. He likes the holes to be spaced fairly widely, to encourage the garlic heads to grow “really big.” In Thurston’s beds, which are about three feet across, he makes four holes across the rows, about six inches apart. Then he travels along the bed about eight inches before he puts in the next set of four cloves. Next, Thurston adds a little something extra to each hole. Animals may be attracted to bone meal, Thurston said, but he hasn’t had problems with animals getting into his garlic. Then, shortly before you’re ready to plant, it’s time to separate the garlic heads into cloves, leaving the papery skins on them. Put the cloves in the holes, with the pointy end facing up and the flat, or root, end facing down. After all the rows are planted, it’s time to cover the beds with stray, hay, pine needles or shredded leaves. This is so that the cloves will be protected against thaws and freezes. Then, you wait. You wait for winter to come and go and for the first tender shoots to poke their way out of the soil in the spring. Once you see that hopeful sign, you’ll know that your garlic is right on time.